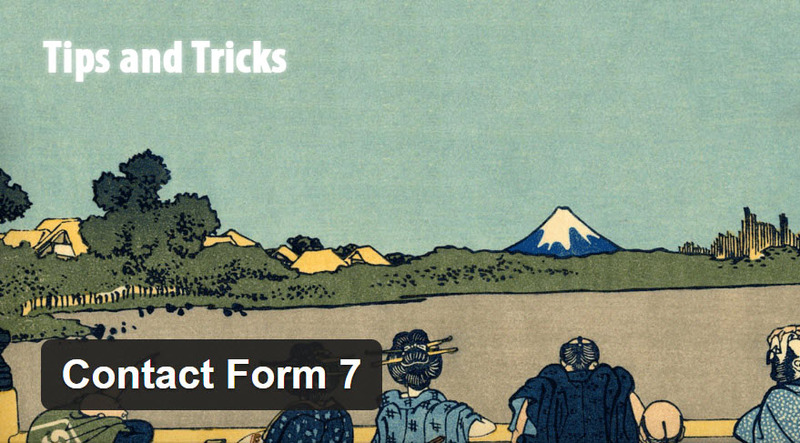 Although there are countless contact forms for WordPress, the tried and true (and free) Contact form 7 plugin is still widely used. Sometimes simple is better and with a little HTML and CSS skills, anyone can create quick forms. Here are the top addons and tips that we implement ourselves. By adding any of these tags to the MAIL section, we can extract some pretty cool info for marketing purposes. For example, I may create one form but place it as a widget for blog post pages. This will help attribute which blog post may have helped bolster the contact message. [_user_agent] Gets their user agent info. This show you info such as Operating system and browser used. There are much more mail tags on the Contact 7 website. As of now (5/19/17), the Contact Form Submissions plugin by Jason Green is the only functioning plugin that allows you to save, search, and export submissions. It’s good practice to compare the database entries with your actual emails! You can add more than 1 email address here. Just seperate them with commas. This is very important! Make sure the from domain matches the website domain name. If you don’t mail could go into a black hole. This is where the actual email body is. Use mail-tags to define it properly. 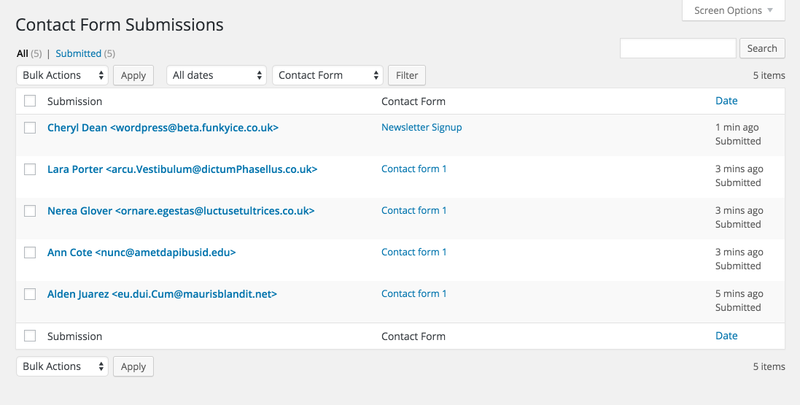 By default, visitors will just see a message at the bottom of the contact form upon submission. However, this feels cold. They just submitted some information (probably personal) and should be redirected to another page of your choosing where you can track conversions and/or provide more call to actions. Examples of more call to actions could be social media feeds so they can follow you, links to a FAQ section to possibily answer their question sooner, a downloadable PDF (that some something useful for them!) or even an upsell section. Conversion examples could be Adwords conversion tracking code or a Facebook pixel code to track a succesful submission (lead). The old method of redirecting is depreceated but you can use the plugin below. 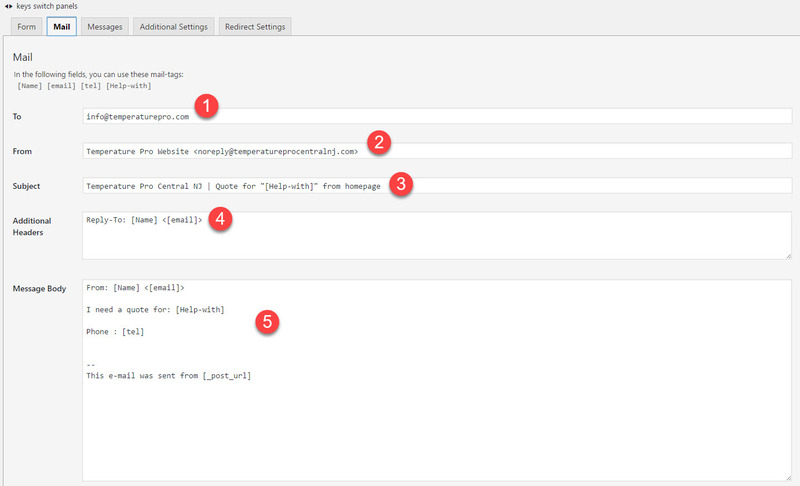 You should be using a SMTP mailer plugin such as POSTMAN SMTP. It also supports OAuth 2.0 for increased security. Here are some features directly from the author’s wordpress plugin page.